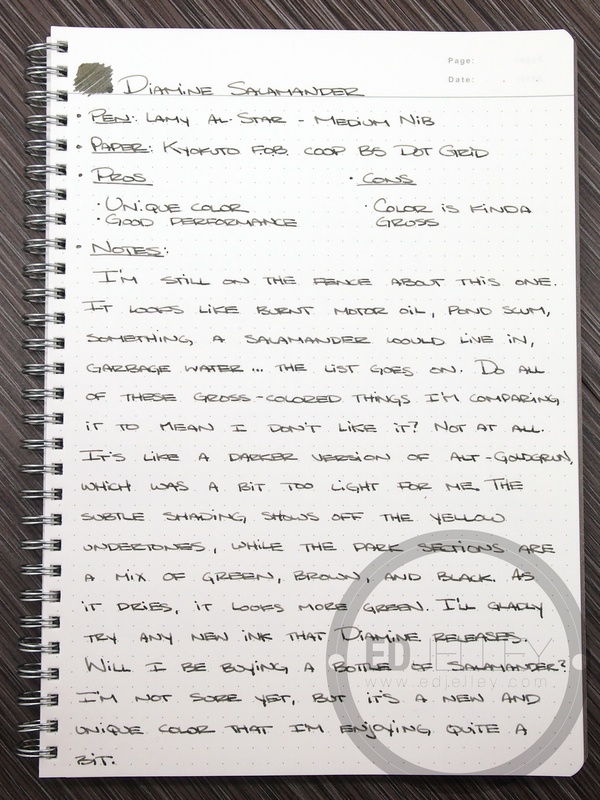 At the time of writing, I said I was still on the fence about this ink. I’ve been converted. I’ve been enjoying it quite a bit. It looks kind of like burnt oil, pond scum, spa mud, garbage water, and after a quick google image search, it looks a lot like a salamander. Do all of these gross-colored things I’m comparing it to mean I don’t like the ink? Not at all. It’s like a darker version of Rohrer and Klingner’s Alt-Goldgrun, which was a bit too light for me. 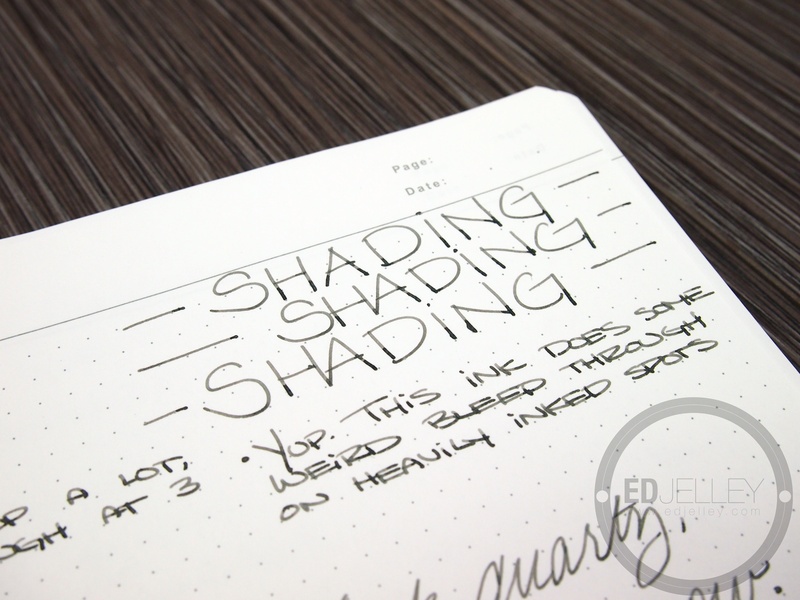 The subtle shading shows off the yellow undertones of the ink, while the sections where the ink pools look near-black. 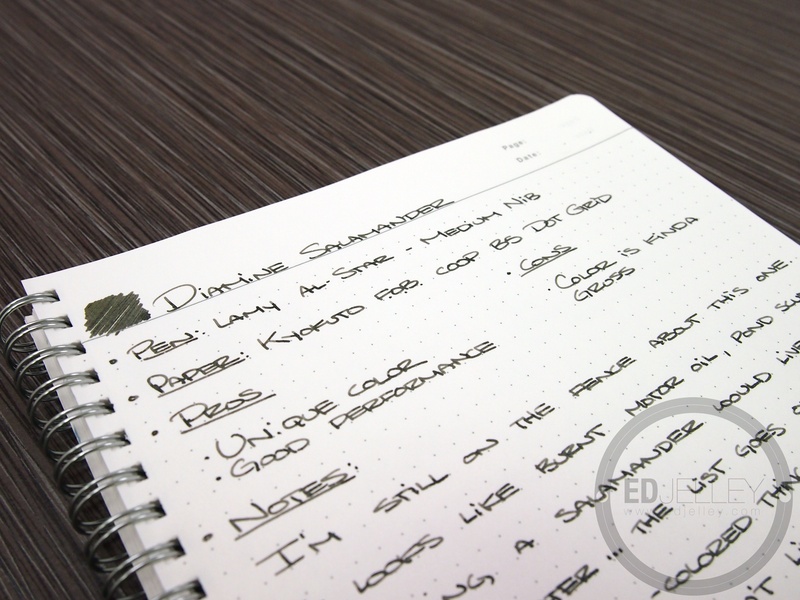 Once the ink is dry, it’s more obvious that this is a dark green with brown and black hues as well. 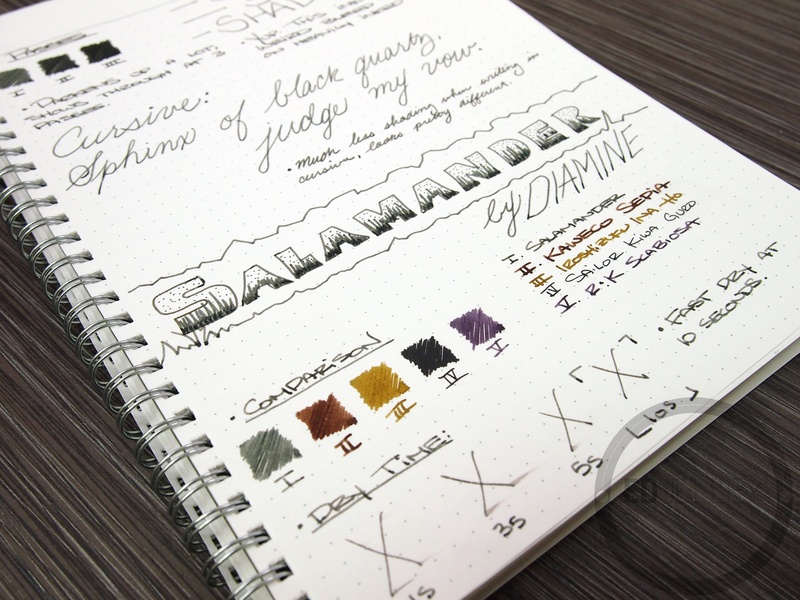 I’ll gladly try any new ink that Diamine makes, they’re one of my favorite brands in terms of color offerings and performance. 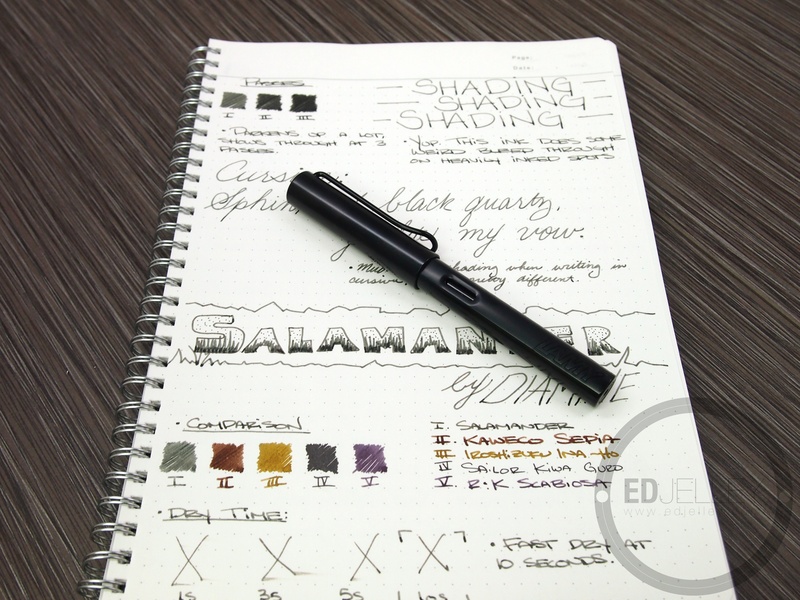 The Salamander flows and dries just like I’d expect, and the ink goes down smoothly in the Lamy’s medium nib. Will I be buying a bottle of Salamander? 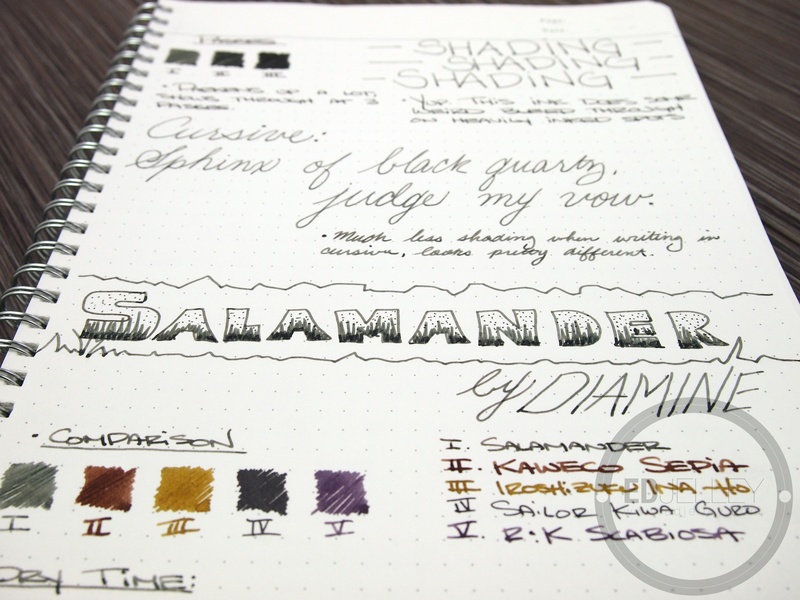 I’m not sure yet, but it’s certainly a unique offering from Diamine that I’m enjoying quite a bit. Thanks for the review. I have a sample of this and I’m really liking it! 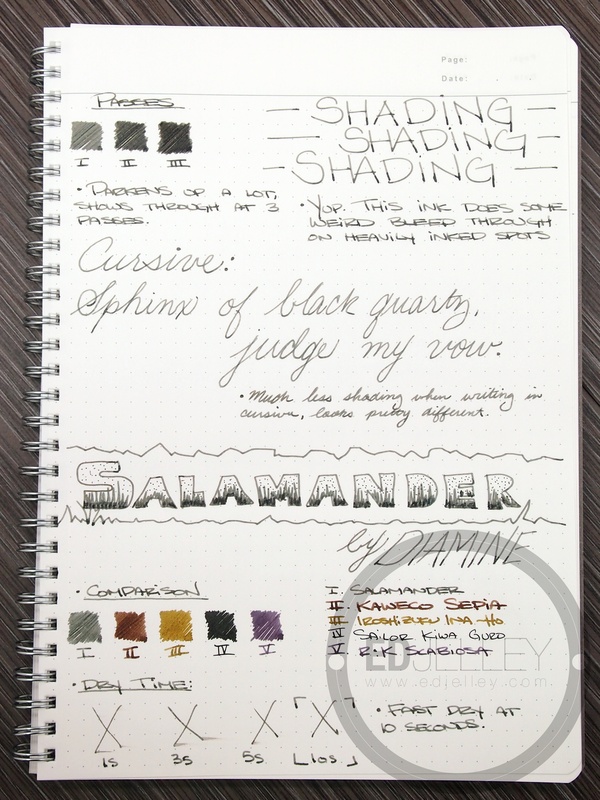 It seems to me like a happy medium between J. Herbin Vert Empire and Noodler’s Zhivago. 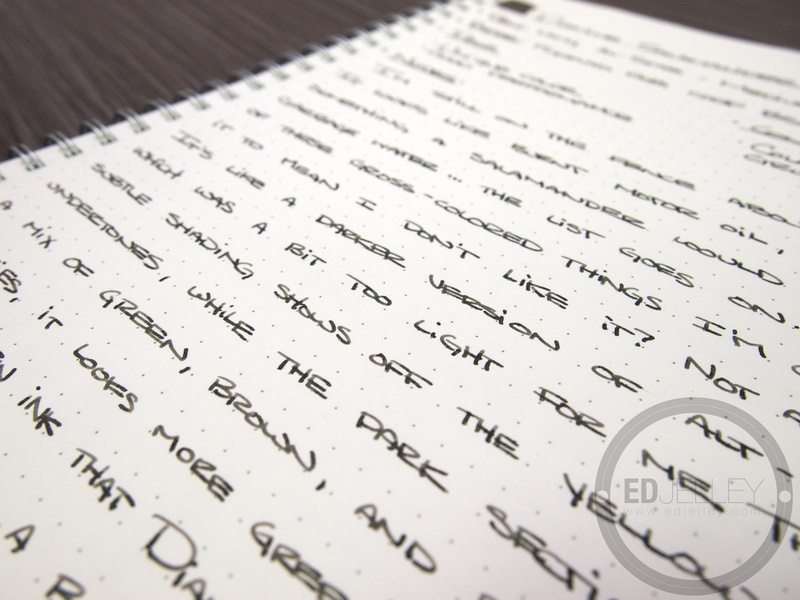 Ed, just as I find this ink and start to look it up, your review appears! I do like your tradeoff against Alt Goldgrun (I agree totally, I really want to like it but it’s too light). 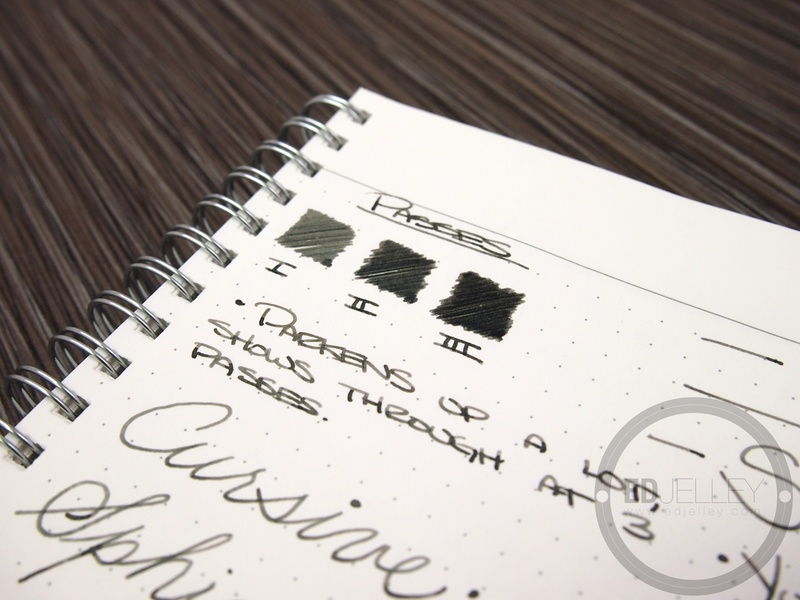 I’ve graduated through Diamine Teal, Graphite, Umber, Green Black, and now I think I have to buy this ink based on your really in depth review. I find that I’m orbiting around really ‘different’ greens at the moment, PR Avacado, Robersons Olive Peridot, R&K Verdigris (okay, not really a green per se but sitting on the fence), and MB Jonathan Swift – which I still have to find a pen that shows it off. Thanks very much for going to all that effort for all of us, it’s greatly appreciated. “The unique color is also a little gross” LOLOL awesome. That cracked me up. Haha yeah, my language in this one was definitely different.